Angelfish members of the Pomacanthidae family are omnivores that feed on both marine plants and animals, but a large number of species lean towards being more herbivorous. These fish are constant nibblers and grazers. While many prefer to eat macro and filamentous type algae, some others prefer microalgae or diatoms. Most all feed on small crustacean marine life, but there are some species that are solely live sponge feeders. Those that live on sponges as their sole source of food may starve in captivity. If you are interested in keeping one of these species, it wise to wait for a larger juvenile or sub-adult specimen. In most cases, these specimens will adapt to tank fed foods more readily than very small juveniles or large adults. They can be raised on the many frozen fares that are now available on the market that include edible sponges in them to supplement their diets along with other suitable Angelfish fares. We have found that many fish, just like many other animals, will imitate other fish when they see them eating something. When you acclimate a new fish into your saltwater aquarium, if they see another fish (particularly one of the same or similar species) eating a specific food, they will also be tempted to try it out. One of the greatest obstacles to overcome with a new fish is that it may be overly stressed due to being collected, held for a period of time at the collectors site, then shipped to a trans-shipper where it may or may not eat or even be fed, then on to your Local Fish Store where you finally see and buy it. In the best of cases, by the time you get your new fish to your aquarium, it may have gone a week or so without eating anything. It has been our experience that, many times, if a fish hasn't eaten for a long long period of time that it loses its appetite altogether and won't eat even its preferred food from the wild. For this reason, it is always wise to have the LFS person who is trying to sell you a fish to have them demonstrate that and what a fish is eating before buying it. Angelfishes should be introduced into a well-established aquarium with an ample supply of algae and other live rock growth present to feed on because for most all species this is their primary food source in nature. By providing this type of habitat it stimulates their feeding instincts, which in turn helps them adjust to accepting tank fed foods such as Spirulina, nori and other dried or frozen preparations for herbivores, vitamin-enriched and color enhanced "marine" flakes, live brine or mysid shrimps, finely chopped dried or frozen crustacean or other high-quality meaty fares suitable for carnivores. Foods that are not already vitamin-enriched can be soaked in a liquid vitamin supplement such as Selcon. 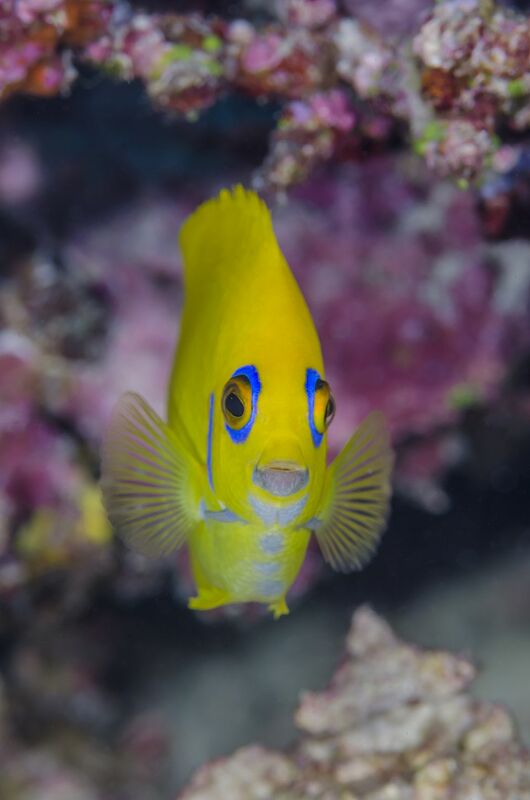 A majority of angelfish species have a tendency to nip at large-polyped stony corals, zoanthids, and tridacnid clam mantles, and some may also pick at soft coral polyps or other sessile invertebrates. Therefore, Angelfishes cannot be completely trusted in reef tanks, particularly when these types of invertebrates are present. One noted exception is the Japanese Swallowtail Angelfish (Genicanthus melanospilos) which is a mid-water fish which is found in the western Indo-Pacific to Australia areas. Most Centropyge genus Dwarf or Pygmy Angelfishes, such as the Flame (C. loriculus) and Potter's (C. potteri) for example, are touted by aquarists as being fairly good reef safe species. Regardless, there is no guarantee they can be fully trusted. For more information on the selection of Angelfishes as being good starters or ones to avoid, refer to our Before You Buy Angelfish Rating Charts, as well as read individual Angelfish Species Profiles.